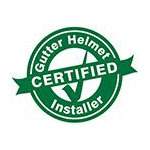 Seamless Exteriors is proud to be an authorized dealer of Gutter Helmet, the leading brand of gutter covers in America. We have helped countless homeowners in Cedar Falls, IA and nearby areas by keeping their gutters protected from clogging and ice dams that can cause significant damage to your roof and the rest of your home. Gutter Helmet isn’t just any type of gutter cover. Its revolutionary nose-forward design has proven effective at keeping unwanted debris such as leaves and fallen branches from ending up in the gutter channel and preventing rainwater or snowmelt from flowing properly. Designed with both durability and ease of maintenance in mind, Gutter Helmet will keep your gutters clog-free for years without the hassle associated with routine cleaning and repairs. Our team is composed of highly-trained professionals with years of experience in the home improvement industry. They have the skills and materials to make sure that your Gutter Helmet gutter covers are installed according to manufacturer specifications, to ensure the best results. We value our relationship with our clients, that’s why we put a heavy emphasis on providing customer satisfaction. We make it a habit to treat our customers with world-class professionalism and offer our services at reasonable prices. Want to know more about the best form of gutter protection in Iowa and the rest of the country? Call us today at (800) 824-3772 for inquiries, or fill out our online form to request a free quote!